The Fighting Sioux was a distinguished and honorable legacy. The University of North Dakota carried that name as a badge of honor – it was a source of immense pride to have worn the colors of the Sioux. That’s gone now; replaced by the logo of a bird; a hawk. By itself it’s fine. We have the Eagles, damn them!, and the Falcons, the Seahawk and even the Hawks. 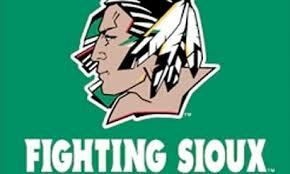 But North Dakota will always be the Fighting Sioux to me. I never went to Mariucci to watch the Hawks. We’re told that we can’t have the Sioux – not because we felt that we were being ignored or insulted. Not because that we as white people didn’t feel included by our team being named after Sioux warriors. No. We were told that we couldn’t be Sioux because it was insulting to the Sioux. Anyway, I can’t win ’em all. Snowflakes by the hundreds are happily graduating UND as Hawks. Fallout continues from a decision made by the Johnston County School Board to approve a controversial mascot for Selma Middle School which will become a ReStart school in 2018-19. The current mascot is the “Vikings” – the only mascot the school has ever known – and many teachers, current and former students and community members did not want the mascot name or logo to change. Victor E. Viking is the face of Western, but some students and a professor are looking to change that. The idea of changing the mascot was brought up at an Associated Students Board meeting earlier this month. Abby Ramos, the AS Vice President for Diversity, said that this conversation started in the summer to discuss changing the mascot to be a more inclusive figure. Ramos and AS President Belina Seare received a letter from communications studies professor Michael Karlberg regarding the mascot. “I think this mascot also reflects a sort of hyper masculine, hyper violent sort of image which is doubly problematic. I think we really ought to reconsider,” Karlberg said. The Viking mascot has been in effect since 1923, University Communications Director Paul Cocke wrote in an email. The letter was also sent to President Bruce Shepard, but neither responded to the email, Karlberg said. “I was trying to invite a conversation about whether or not the mascot supports our commitment to diversity, our commitment to create a more safe and attractive and inclusive environment on campus,” Karlberg said. “[The mascot] doesn’t portray students of color on this campus and it can be very exclusive to students who are potentially looking at coming to Western,” Ramos said. We can’t be the Sioux because we are disrespecting the Sioux and we can’t be the Vikings because we are disrespecting the Sioux? The people are LOOKING to be offended. They are LOOKING for opportunities to divide. They are ACTIVELY seeking out the opportunity to divide. When you find these people in your life, don’t walk – run away! This entry was posted in Politics: National and tagged Fighting Sioux, Mascot, North Dakota, Social Justice Warrior, Vikings. Bookmark the permalink. Sheesh. I’m with you on this one – for both the Fighting Sioux and the Vikings. People take things way too seriously….